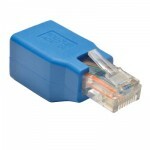 Tripp Lite's Cisco Rollover Adapter can be used to convert any standard Ethernet cable into a serial Rollover cable. The Rollover Adapter eliminates the need for carrying extra cables. Plugs into a RJ45 serial console port on switches and routers, and internally "rolls" the pins so that a straight through Cat5e or Cat6 patch cable can be used.